We see all manner of electronics enclosures pass through these hallowed pages. Lasercut wooden builds with fancy kerf bending, expertly prepared acrylic boxes, and even the occasional device cast in concrete. [Mike Kohn] decided that all of these were too permanent, however, and chose a different material – ice. [Mike] shares the ups and downs of his experiments with electronics and frozen water. Initial tests with a circuit sealed in DAP Ultra Clear were largely successful. A tilt sensor was installed to allow the batteries to remain undrained during the freezing process, and once freed after a few hours of thawing, the circuit was operational. Later builds required some more work – the RC car in particular took a few attempts to avoid the mold leaking. The ice hands are a particular highlight, though – created with rubber gloves, these would be a remarkably spooky decoration come Halloween. It’s a study in the techniques required to work with this ephemeral material, and there’s a few lessons to learn. Sealing electronics is good, and the best results are with simple circuits with a few LEDs that make everything glow nicely. If you’re looking for other ideas, you could always create a frozen lens for photographical purposes. Video after the break. Music, food, and coding style have one thing in common: we all have our own preferences. On the other hand, there are arguably more people on this planet than there are varieties in any one of those categories, so we rarely fail to find like-minded folks sharing at least some of our taste. Well, in case your idea of a good time is calling a service hotline for some exquisite tunes, [Fuzzy Wobble] and his hold music jukebox, appropriately built into a telephone, is just your guy. Built around an Arduino with an Adafruit Music Maker shield, [Fuzzy Wobble] uses the telephone’s keypad as input for selecting one of the predefined songs to play, and replaced the phone’s bell with a little speaker to turn it into a jukebox. For a more genuine experience, the audio is of course also routed to the handset, although the true hold music connoisseur might feel disappointed about the wide frequency range and lack of distortion the MP3s used in his example provide. Jokes aside, projects like these are a great reminder that often times, the journey really is the reward, and the end result doesn’t necessarily have to make sense for anyone to enjoy what you’re doing. As these old-fashioned phones gradually disappear from our lives, and even the whole concept of landline telephony is virtually extinct in some parts of the world already, we can expect to see more and more new purposes for them. Case in point, this scavenger hunt puzzle solving device, or the rotary phone turned virtual assistant. The Etch-a-Sketch was a hugely popular toy in the days before video games and the Internet became ubiquitous. These days, they’re a fun amusement, but can still be difficult to master. Rather than learn the necessary skills himself, [Martin Fitzpatrick] decided to build a machine to draw for him. Enter the Etch-a-Snap. The build starts with a Raspberry Pi Zero, equipped with the requisite camera. Images taken are processed into a 100×60 pixel image with 1-bit color. At this stage, a network graph representation is built of the image and used to generate commands for the plotting mechanism to draw the scene. Plotting is achieved with stepper motors that turn the knobs through 3D-printed gears. Plotting is slow, with images taking 15 minutes to an hour to “develop”. The system can also be used to draw manually processed images, which can improve results when images are chosen carefully. It’s a project that combines modern hardware with a classic toy for some interactive fun. We could imagine a large-scale version of this being a great installation at a science museum or MakerFaire. We’ve seen others tackle a computer-controlled Etch-A-Sketch, too. Video after the break. 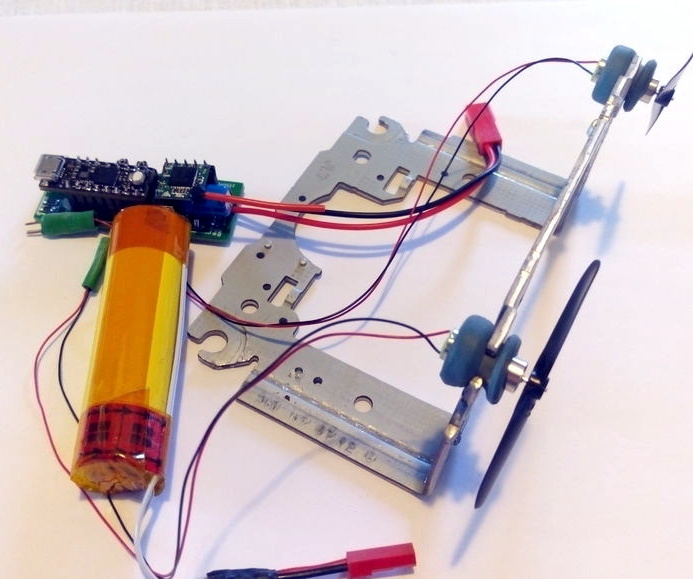 What do you get when you combine an old optical drive, some empty soda bottles, and a microcontroller? Well…nothing, really. That’s still just a pile of rubbish. But if you add in a battery, an RC receiver, and some motors, you’re getting dangerously close to a fun little toy to kick around the pond as [Antonio Rizzo] recently demonstrated. A couple of plastic bottles lashed together make up the hull of the boat, and [Antonio] has used the internal frame of an old optical drive bent at a 90 degree angle to hold the two small DC motors. In a particularly nice touch, the drive’s rubber anti-vibration bushings are reused as motor mounts, though he does admit it was just dumb luck that the motors were a perfect fit. For the electronics, [Antonio] has paired a custom motor controller up with the uChip, a diminutive Arduino-compatible microcontroller in a narrow DIP-16 package. Wireless communication is provided by an off-the-shelf cPPM receiver such as you might see used in a small plane or quadcopter. The whole build is powered by a common 18650 lithium-ion battery, which could also be easy enough to recover from the trash given how common they are in laptop batteries; though if you threw a new cell into this build we wouldn’t hold it against you. Everything is put into a high-tech plastic sandwich bag to provide minimum of waterproofing with the minimum of effort. If using a commercial RC receiver and transmitter is a bit too mainstream for your tastes, you could always roll your own radio. [VegOilGuy] begins the build with a simple plywood box, which gets screwed together and then tarted up with bodyfiller and paint. This helps to make the box airtight, as well as improving the aesthetics. A slot is then cut in the lid, and then filled with an excessive amount of silicone sealant. A flat plate covered in aluminium foil is placed on top, and the silicone is left to cure for several days.This is used to create a flat sealing surface for the lid to be placed on later. Once the seal is complete, it’s a simple plumbing job to finish the chamber. [VegOilGuy] does a great job of demonstrating copper soldering and the proper way to install the necessary taps and check valves. Combined with an electric pump, the vacuum chamber passes its tests with flying colors, completely ruining some marshmallows in the process. With a few dollars spent online for the special bits, it’s a build that any handy maker could throw together in a weekend. You can always go another route, though – like using an old fridge compressor to get the job done. Regular readers of Hackaday are intimately knowledgeable about old electronics, and whether it’s about that old oscilloscope sitting in the pile of other oscilloscopes, or the very rare vintage computer made in a Soviet bloc country, someone somewhere knows how to fix it. One of the biggest problems with these old electronics are capacitors. If it isn’t the battery that’s gone dead and leaked all over, it’s the caps that are either out of spec or have already exploded. These machines can be brought back from the dead, and in recent months and years we’ve seen an uptick in the number of restomods hitting the Hackaday tip line. If you have a soldering iron and the patience to do so, any machine can be brought back from the grave. Hackaday Podcast Ep014: Keeping Raspberry’s SD Card Alive, We Love MRRF, And How Hot Are Flip Chips? Elliot Williams and Mike Szczys take a look at advances in photogrammetry (building 3D models out of many photographs from a regular camera), a delay pedal that’s both aesthetically and aurally pleasing, and the power of AI to identify garden slugs. Mike interviews Scotty Allen while walking the streets and stores of the Shenzhen Electronics markets. We delve into SD card problems with Raspberry Pi, putting industrial controls on your desk, building a Geiger counter for WiFi, and the sad truth about metal 3D printing. Take a look at the links below if you want to follow along, and as always, tell us what you think about this episode in the comments!